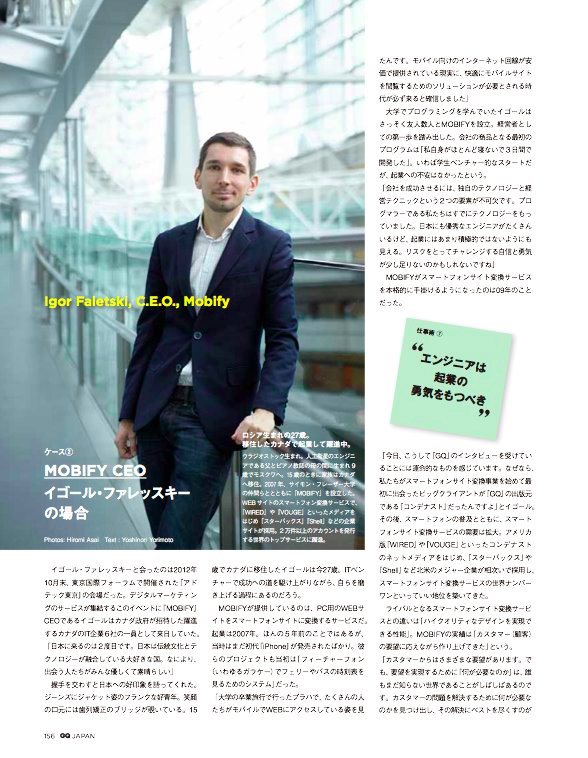 Being curious about the future of the mobile web and other things, I recently had a conversation with Mobify’s CEO and co-founder Igor Faletski. Rumours around the Vancouver startup community suggested he’d know a thing or two. Turns out the rumours are true. The young guy who moved to Canada with his family from Vladivostok, and co-founded the company with SFU classmates John Boxall (CTO) and Peter McLachlan (Chief Architect) in 2007, has a lot to share. We might still call it a phone, but the time we spend surfing, gaming, sharing pictures, or socializing exceeds the minutes we spend talking. The way Faletski sees it is “how we use our devices isn’t about the phone, it’s about apps, and remember the browser is an app too. The way websites present themselves to users will drastically change. Websites will soon, more and more feel like native apps do…instant, personalized.” His mission is making this come true. He admits the iPad wave both caught them by surprise, and is now driving a whole new conversation. Knowing Faletski has entrepreneurship hard wired into his DNA, as is evident from his TEDxSFU talk in September, I closed our conversation asking him to give out advice for the three person startup toiling away in some coffee shop. Without hesitation he simply says “get to the first dollar quickly, regardless of the plans to bootstrap or raise funding… things you create need to be useful to people, and money is a great metric to validate the usefulness of your product.